Tamerica improves upon their ingenious GuilloMax guillotine cutter with the all new GuilloMax Plus. This heavy duty stack cutter is capable of easily slicing through 800 sheets of 20lb paper up to 18" long. Equipped with a laser guide for precision cutting, a hand driven paper stop, a wheel driven paper clamp to hold your paper in place, and a variety of safety features, this new GuilloMax-Plus will fulfill all your stack cutting needs. With precision measurement guides in inches, millimeters, and centimeters, along with the laser guide, you can make sure your cuts are perfect every time for every need. Perfect for any school, business, or print shop, the Guillo-Max Plus offers heavy duty, reliable cutting capabilities at an effective price. Check out the all new Tamerica GuilloMax Plus today to see the improvement of production and quality. Protective shield on both sides of blade. Front shield functions as a safety lock. Laser guide for precision cutting. Infrared Light Cut Line Indicator. Dimensions: 37" x 34" x 31"
Guillomax Plus Stack Paper Cutter. I work at a non-profit and wanted a stack cutter big enough to handle 18” sheets, so we could produce letter-size brochures with bleeds. We only cut stacks a few times a week, so I wanted the simplicity and lower price of a manual cutter. Triumph cutters get the best press and the Guillomax Plus is a Triumph copy for a lot less money. I’ve had it 6 months. The shipping crate was impressive and the machinery arrived intact, but the thing was heavy — like wrangling an oven or refrigerator. The machine came with basic assembly instructions, but didn’t have a real owner’s manual — there was no info on replacement parts or alignment. It did come with a bag of hex wrenches, extra bolts, dozens of nuts and washers, a box wrench and screwdriver. Also with two threaded handles for blade removal, and a spare cutting stick. The cutting sticks are 9/16” square by 19.25” long. The stand was included in the price, and that was a selling point, as stands typically cost over $200. On my other - ancient - stack cutter, the stand is a true convenience, and I was happy to get one for the new cutter But, the Guillomax stand caused me serious worry. It had to be assembled from 8 heavy beams, using 16 bolts, and two of the bolt holes were unusable - one was incompletely drilled and one was grossly misaligned. The 'included stand’ was apparently manufactured without serious quality control, and I was afraid the paper cutter would be the same, but I tightened up the stand's14 usable bolts and, with the help of 3 other guys, lifted the cutter out of the crate. It looked good and fit on the stand easily. Initial alignment was okay, but after two months it seemed worse. Adjusting the squareness of the back stop looked like a nightmare, but since the cutter was on a stand, it was easy to examine the underside and it looked simple to adjust the other three sides. The two side walls were attached with 3 hex bolts that allowed easy tweaking. The cutting mechanism is secured with 8 hex bolts — I haven’t tried loosening them to see if it scoots around in a useful manner. The cutting effort required is moderate and shouldn’t be a problem for healthy adults, although it’s noticeable harder to cut a tall stack of 18” wide paper than to cut something smaller. Expect to clean factory oil off the paper clamp and blade a few times — you’ll lose a few top sheets to grease spots. The cutter sometimes vibrates when someone walks past — the black metal paper clamp shakes. Leaving the clamp lightly screwed down reduces the noise. The laser takes two D-batteries, and the blade cuts along the forward edge of the beam in reliable fashion. The laser is useful, but for most cuts I just set the backstop using the built-in ruler. For critical cuts, I’ll chop a piece of scrap paper to make sure the cut is at the right depth (if, for example, I’m cutting a piece of 11” paper into two 5.5” half sheets.) The laser is almost invisible against the red cutting sticks (when there’s no paper in the cutter) and also hard to see when the clamp or the blade is down. It is very easy to leave it on and exhaust the batteries. I haven’t checked the laser mechanism for ease of alignment. The safety interlocks between the blade and the front plexiglass guard work okay, but it seems like it would not be hard to crack the plexiglass if the user was in a hurry and tried to lift the guard at the wrong time. There’s about 8.25” of table surface in front of the blade. The plexiglass shield will raise high enough in the “locked down” position to allow a 1.5” stack to fit under it — that allows for cutting a 17” piece of paper into two 8.5” halves. For smaller pieces of paper, that protrude less than 8” in front of the blade, the Guillomax will accommodate a stack 3” high or more. Overall, I’m happy with the Guillomax Plus. 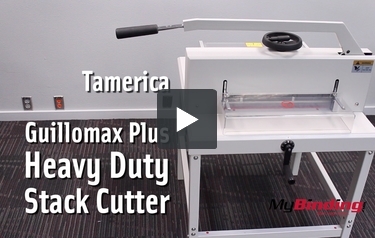 Transcript: This is the Tamerica Guillomax Plus Heavy Duty Paper Stack Cutter! Before we start, we first have to make sure the lever is all the way up, then we can open the clear cover. The front handle adjusts the backstop. Each rotation is equal to one centimeter. So that was two centimeters. You can also disengage the handle so you don’t accidentally bump it and change your measurement. You can see it moving the backstop now. On the side it is measured in inch and centimeters—up to 20 inches. This is the Tamerica Guillomax Plus Heavy Duty Paper Stack Cutter! Insert a ream of paper into the throat of the cutter and align the edges the best you can. You can also use a block to help with this. If you need to, turn on the laser light to help line up your project. It will show where the cut will be made. When ready, close the plastic shield and bring the clamp down by turning the black wheel at the top. This will hold the stack for a clean cut. Then take the lever and bring it all the way down. You’ll see it’s a big lever, and a little awkward, though not too difficult to use. The blade comes down and makes a nice clean cut. Once you release the clamp, you may find marks and indents on your top page—to avoid this, use some scrap paper or chipboard on the top and bottom of the stack to ensure every page is clean! You can also adjust the blade in small increments if you are not getting a full cut. And from time to time you should swap out the cutting mat. This can be rotated four times, then flip and rotated again for a total of 8 clean cutting sections. The GuilloMax Plus is one of your best bets if you're looking for something that can cut a large amount of paper at once. This device has a maximum cutting capacity of 800 sheets, which is almost two entire reams of paper. It definitely won't take you very long to prepare your materials with this machine, that's for sure. This device is large enough to work with paper that's up to 18" long. It's the perfect size for working with letter- and legal-sized paper. The machine has a scale that has both metric and standard measurement units printed on it so you can use whichever system you like. Although the GuilloMax Plus looks intimidating, it's easy to get the cuts you need with a little bit of practice. The device features a laser guide that will help you see just where exactly you're cutting. The machine also has a paper stop that's adjust by a hand crank so you can properly align your materials. Safety is really important when using a stack cutter and luckily, using the GuilloMax Plus is pretty safe. There is a protective shield on both sides of the blade so your fingers will stay out of the way when you're cutting. There is also a rear shield that does double duty as a safety lock. Also, using this device is pretty comfortable since the handle is ergonomically friendly. This stack cutter comes with a stand so you will not need to buy one on your own. Finally, the GuilloMax Plus comes with a 1-year warranty. This cutter is very large so it's going to take up a lot of room. It's not a good choice for really small work areas and using the stand is recommended so you can keep your counters, desks, and tabletops clear. The GuilloMax Plus is designed for heavy-duty use, so it's not recommended if you just need something for occasional cutting. For small jobs, a rotary trimmer or traditional guillotine paper cutter would be a better choice. As you can see, the Tamerica GuilloMax Plus has a lot going for it, beginning with the 800-sheet cutting capacity. This is one device that can make your large cutting jobs as easy as possible. Also, this device is easy to use, it has good safety features, and it even comes with a stand. Just be aware that the cutter will take up a lot of room and that it's best for larger jobs. If the GuilloMax Plus sounds like the right cutter for your needs, be sure to check it out. Does the GuilloMax Plus cut the bindings off of books? If not, do you have another product that is better suited to do so? Thanks. Thank you for your question. The Tamerica Guillomax Plus Heavy Duty Paper Stack Cutter would be able to cut the spine off of a book. To get the best results you would want to only do one book at a time. About how big is the footprint of this cutter and stand? Thank you for your question. The dimensions are approximately 37” x 34” x 31”. What is the weight, including ab excluding the stand? Thank you for your question. We contacted the manufacturer and the shipping weight is 209 lbs with the stand. They do not have a weight without as they shipped and sold together a unit.